This chapter is a very personal and subjective overview of some potentially harmful aspects of society and education in Japan. Social psychology has warned us for many years about the danger of increasing isolation and individualization (III) along with reactive affiliations (e.g. Nazism) just for the sake of belonging to something. Fromm wrote in his 1941 book Escape from Freedom, “to feel completely alone and isolated leads to mental disintegration just as physical starvation leads to death” (p. 17). More recently, biology (Wilson, 1975/2000) and neuroscience (Lieberman, 2013; Cosolino, 2013; Sapolsky, 2018) have stressed and exposed our social needs. Hari’s recent book Lost Connections (2018) has exposed the billion-dollar antidepressant industry as mostly unnecessary when we learn how to socially reconnect with others and our core values. And most recently the UK has created a minister for loneliness position in their government (BBC, 2018) to fight the ill effects of III. Schools it would seem are places where students can go to become more social, but while we teach students in groups we evaluate and score them individually and the amount of social interactions in many classrooms does not often add to a sense of school belonging (Dörnyei & Murphey, 2003; Murphey et al., 2010). This chapter looks at ways to innovate and activate “the collaborative social” in general and during assessments in particular so that students can become more socially adept at bonding and belonging with others. It is unapologetically a blend of several articles and book chapters beginning 30 years ago with my student-made tests (Murphey, 1989). 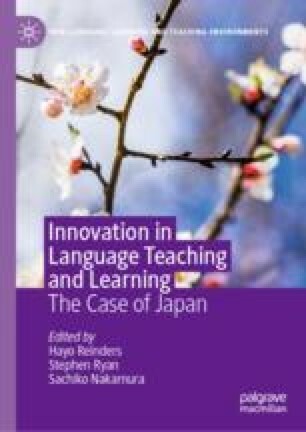 In the introduction below I also reflectively note autobiographically seven sources of innovative practices that I fortunately encountered that I think will tell us how to seed many future innovations in education in Japan. The introduction is followed by three waves of activity around innovating testing. Social testing with student changing partners every few minutes (circa 2014). They can only ask one or two questions per person, and are not supposed to look at the papers, only ask and listen and write. About 20 minutes of solo time at the beginning and then 10–20 minutes social time. When there is a question that no one seems to be getting, I go to a low-level shy student and help him find the answer, then I announce to the class, “Hiro has the answer to #8” and suddenly Hiro gets a lot of attention and can enjoy helping many people. Can students learn powerful social skills while testing like ‘asking’ or scaffolding and even friend-making? Can students self-evaluate themselves at least partially to give teachers an idea of what they think of themselves and strengthen their abilities to self-evaluate as they will be doing for the rest of their lives? Minister for loneliness appointed to continue Jo Cox’s work. (2018, January 17). BBC. Retrieved from https://www.bbc.com/news/uk-42708507. Murphey, T. (2003a). Assessing the individual: Theatre of the absurd. Shiken: JALT Testing & Evaluation SIG Newsletter, 7(1), 2–5. Available online at www.jalt.org/test/mur_2.htm. Murphey, T. (2017c). A 4-page condensed version of Tim Murphey’s book chapter “Provoking Potentials: Student Self-Evaluated and Socially-Mediated Testing”. Available at STANFORD University’s eNewsletter by Rick Reis “Tomorrow’s Professor”, https://tomprof.stanford.edu/mail/1581#June 30. Murphey, T., & Morris, S. (2018). Short emotional peace video recommendations. Positive Peace Pedagogy Papers #1, 7–9. https://drive.google.com/drive/folders/1gLaZAM_ot7Eb_rz6HnDfBz0Yb8sKtdaE. Rodiger, H., & Finn, B. (2009, October). Getting it wrong: Surprising tips on how to learn. Scientific American: Mind Matters. Retrieved from https://www.scientificamerican.com/article/getting-it-wrong/ and http://www.scientificamerican.com/article.cfm?id=getting-it-wrong. Roediger, H. (2014, July 20). How tests make us smarter. The New York Times Sunday Review. Retrieved from https://www.nytimes.com/2014/07/20/opinion/sunday/how-tests-make-us-smarter.html. Shaw, G. B. (2008). Annajanska. Accessed June 10, 2008 from http://www.notable-quotes.com/s/shaw_george_bernard.html (original source: Maxims for Revolutionists).